At Value Blinds & Heirloom Designs, we offer a wide variety of vertical window coverings for your windows or doors, including sleek vertical shades, trend-setting window panels, and traditional vertical blinds. Our vertical window covering collection includes products made from fabric, vinyl, aluminum, and wood. Below are a few of our most popular styles. Many popular horizontal shades are also available in stylish vertical applications that can match the other window shades in your home. Honeycomb shades, for example, can give you complete privacy while gently diffusing light. Many sheer shades are also available in vertical applications. Match the color and fabric to your horizontal shades, or mix and match for a unique style. Skyline® Gliding Window Panels are a patented twist on vertical blinds. A smooth, contemporary design lends drama to any décor, whether covering large windows or when used as a unique room divider. Open, window panels stack tightly for a maximum view. Closed, they’re a fashion statement with rich and sophisticated fabrics and textures. Available in varying widths, window panels are also popular as a room divider in large, open spaces. 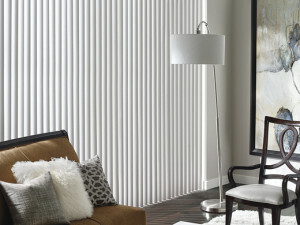 Traditional vertical blinds are a stylish option for large windows and sliding glass doors. Vertical vanes are available in a variety of colors and textures made from beautiful genuine wood or long lasting man-made materials such as vinyl or fabric. Decorative valances add enhanced style and color to your vertical blinds. Easy to operate with standard manual systems, our selection of vertical blinds can also be motorized – a must for very large windows! Value Blind & Heirloom Draperies is a locally owned business serving the Washington DC metro area and Northern Virginia since 1997. Visit our Hunter Douglas Gallery showroom in Ashburn and see hundreds of window fashion and vertical blinds samples and functional displays. Proudly serving Spotsylvania, Reston, Warrenton, and Herndon. Contact us today to schedule a consultation.